The 2017 OHL Playoffs are well underway and it’s time to take a look back at the season that was. Several teams will have updates to make in their respective team record books over the summer after a number of new records were set across the league on team and individual levels. The Erie Otters were in the headlines often throughout the 2016-17 campaign, seemingly setting new records every few weeks. Dylan Strome, Alex DeBrincat and Darren Raddysh all re-wrote franchise records as the Otters made Canadian Hockey League history, earning their second straight Hamilton Spectator Trophy and third consecutive Midwest Division title in the process. There’s all that and more below! Here’s a look at new benchmarks set during this past season. – Became the first team in CHL history to record four consecutive 50-win seasons while capturing their second straight Hamilton Spectator Trophy and third consecutive Midwest Division title. – Set new franchise record with 14-game winning streak from Jan. 20th to Feb. 20th, surpassing prior mark of 11 consecutive wins during the 2013-14 season. – Qualified for the OHL Playoffs for the first time in team history. – Set a new club record with 11 goals in an 11-2 win in Saginaw on Jan. 10th. – Posted franchise lows in goals for (179) and penalty minutes (629) which were both league-lows. – Won the first Central Division title in Steelheads history. – Set new Steelheads marks for wins (34) and points (81). – Set new franchise marks for wins (49) and points (102), surpassing their prior highs set in 2010-11. – Set a new franchise record with a 15-game winning streak from Dec. 9th to Jan. 26th. – First East Division title since 2006. – Set a new franchise low for penalty minutes in a season with the league’s second-lowest total of 695. – Set a new franchise record for shorthanded goals in a season with 22, surpassing prior mark of 20 set in 1991-92. – New record for road victories with 26, surpassing prior record of 23 in 2014-15. – New record for fewest road losses with eight, besting former mark of 11 in 1980-81 and 1984-85. – Kole Sherwood tied a Firebirds all-time franchise record with five goals on Jan. 10th in Saginaw. His mark ties Kevin Brown’s five-goal effort with the Detroit Jr. Red Wings in 1993-94. The five goals were part of a seven-point outing for Sherwood. – Connor Bunnaman tied a Rangers mark for most power play goals in a game with three on March 11, 2017 vs. Flint. – Michael McLeod set a new Steelheads record with six points (3-3–6) in a 10-1 win over Peterborough on Feb. 24th. – Competed in two 14-round, 28-shooter shootouts this season including Jan. 25th vs. Kingston and Feb. 17th in Oshawa. These mark the second-longest shootouts in OHL history. – Petrus Palmu set a new franchise record, scoring four seconds into the second period on Sept. 28th vs. Hamilton. Palmu tied an OHL record set in 1989 by London’s Doug Synishin in the process. – Sean Day’s overtime winner completed a hat-trick in the final game at Joe Louis Arena on Dec. 4th against Saginaw. It was also his 200th career regular season game. – Alex DeBrincat captured the OHL scoring title with 127 points including an Otters franchise record 65 goals along with 62 assists in 63 games. – DeBrincat tied Mike Ricci’s 1988 OHL record with goals in 19-straight games from Jan. 24th to Mar. 10th. – DeBrincat finished the season tied with Connor McDavid (2014-15) for the longest point streak in franchise history at 27 games spanning Jan. 14th to Mar. 18th. – Darren Raddysh set a new mark for points by an Otters defenceman on Feb. 26th in Owen Sound. He surpassed Chris Campoli’s 2003-04 mark of 66 points. Raddysh led all OHL defencemen with 81 points (16-65–81) this season. – Taylor Raddysh reached the 100-point mark on Mar. 5th in Niagara, becoming the sixth player in Otters history to hit triple digits in a single-season. 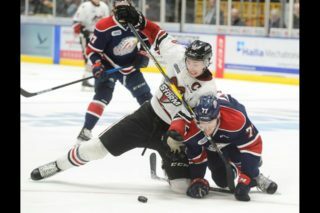 – Taylor Raddysh’s plus-67 plus/minus rating led all OHL players and is the highest in OHL history since London’s Danny Syvret was plus-70 in 2004-05. – Troy Timpano began the season with 13 straight victories from Oct. 7th to Nov. 11th, setting a new Otters franchise record for consecutive wins by a goaltender. – Ryan Moore’s 39 goals are the most by a Firebirds/Whalers player in a full season with the team since Tyler Seguin scored 48 in 2009-10. 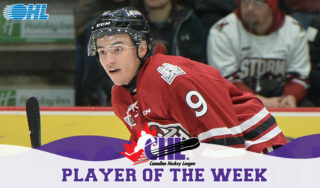 – Ryan Merkley became the first rookie in franchise history to lead the team in scoring and is the first OHL defenceman since London’s Rick Corriveau in 1987-88 to lead league rookies in scoring. – Merkley’s 55 points are the most by a Storm 16-year-old since Jeff O’Neill (79 pts.) in 1992-93. 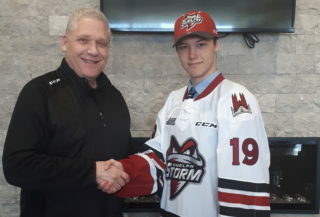 He finished one point shy of Kevin Mitchell’s 1997-98 franchise mark for Storm rookie defencemen. – Matthew Strome is first Bulldogs 30+ goal-scorer, finishing the season with 34. – Eemeli Rasanen’s 39 points are the most by a Kingston rookie defenceman since 1988-89 when Drake Berehowsky of the Kingston Raiders had 46. – Linus Nyman’s 26 goals are the most by a Frontenacs rookie since 2008-09 when Ethan Werek scored 32. – Adam Mascherin reached the 100-point plateau on March. 18, 2017 vs. Owen Sound, joining Jason Akeson (2010-11), Justin Azevedo (2007-08) and Evan McGrath (2005-06) as the fourth Ranger in the past 20-years to accomplish the feat. – Victor Mete (44), Evan Bouchard (44) and Olli Juolevi (42) combined to give the Knights three defencemen with over 40-points in their lineup for the first time since 1989-90 (Rick Corriveau, Steve Boyd, Paul Holden), not including Mitchell Vande Sompel who recorded 53 points, 16 of which came with London. – Owen Tippett tied Alexander Nylander’s 2015-16 single-season Steelheads record of 75 points. His 44 goals are the most in all-time franchise history since Justin Donati (46) of the Toronto St. Michael’s Majors in 2005-06. – Tippett’s 44 goals set a new Steelheads single-season mark, surpassing Dylan Smoskowitz’ prior benchmark of 33 in 2012-13. – Akil Thomas set a Niagara IceDogs record for points by a rookie with 48 (21-27–48), surpassing the prior mark of 42 set by Marco Insam 2008-09. His 20 goals are the most in IceDogs all-time franchise history since Rob Scremp’s 26 in 2002-03. – Stephen Dhillon set IceDogs all-time franchise records for saves (2,114) and minutes played (3,433), also becoming the third OHL goaltender in the past 10 years to make over 2,000 saves in a season. – Medric Mercier’s 21 goals with Oshawa are the most by a Generals defenceman since Jim Baxter (22) in 1998-99. – Michael McNiven set a new mark for wins by a goaltender (41), surpassing the prior mark of 32 set by Jordan Binnington in 2012-13. – Jonah Gadjovich (46), Nick Suzuki (45) and Petrus Palmu (40) combined to give the Attack three 40-goal scorers for the first time since 1992-93. (Andrew Brunette – 62, Jim Brown – 53, Jason MacDonald – 46). – Matthew Timms’ 63 points are the most by a Petes defenceman since Chris Pronger’s 77 in 1992-93. – Nikita Korostelev’s 7-for-7 (100%) showing in shootouts is the OHL’s best since introducing the shootout in 2005-06, surpassing Brampton’s Wojtek Wolski (6-for-6, 2005-06) and Erie’s Zack Torquato (6-for-6, 2006-07). 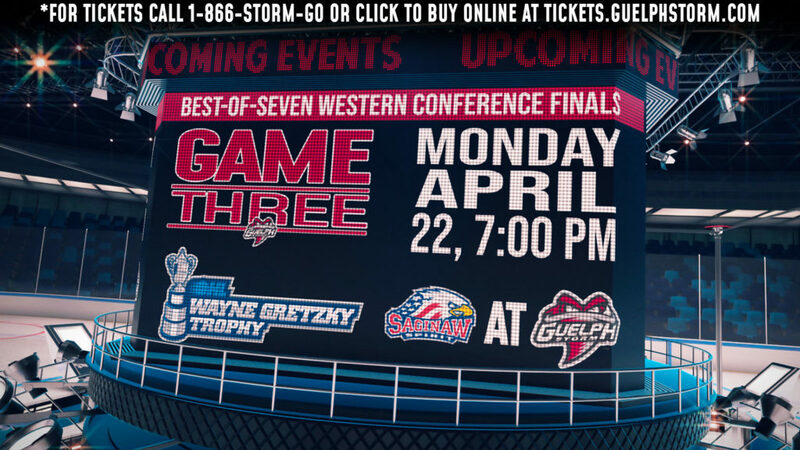 (Five of the seven goals came while with Sarnia). – Filip Hronek’s 61 points (14-47–61) are the second-most by a defenceman in Spirit history and most since Patrick McNeill’s 77 (21-56–77) in 2005-06. – Jordan Kyrou had points in an OHL season-high 30 straight games from Jan. 1st to Mar. 12th, coming within four games of Trevor Letowski’s 1996-97 franchise record of 34 consecutive games. Kyrou’s 30-game run is the OHL’s longest since 2008. – Matthew Villalta’s 2.41 goals-against average is a new Greyhounds single-season record, besting Kyle Gajewski’s mark of 2.44 in 2007-08. – Villalta’s 16-straight wins from Sept. 24th to Feb. 10th is the OHL’s longest streak since Niagara’s Mark Visentin won 17-straight during the 2011-12 season. – Boris Katchouk became third player in franchise history along with Wayne Gretzky (1977-78) to score seven shorthanded goals in a season. The Hounds’ franchise record remains held by Steve Gatzos, who scored 10 in 1980-81. – Zach Senyshyn became the first Greyhounds player to register back-to-back 40-goal seasons since Richard Uniacke in 1996 and 1997. – Dmitry Sokolov’s 48 goals are the most by a Wolves player since Norm Milley’s 52 in 1999-2000. – Michael DiPietro bested Andrew Engelage’s franchise record 2.35 goals-against average set in 2008-09. DiPietro’s GAA (2.35093) comes out slightly lower than Engelage’s (2.35255) when the average is extended beyond two decimal points. – DiPietro’s sixth shutout on Feb. 2nd vs. Saginaw set a Spitfires single-season shutout record in the modern era, placing him ahead of Andrew Engelage who posted five shutouts in 2008-09. DiPietro pulls even with Spitfires all-time goaltending great Glenn Hall, who also recorded six shutouts back in the 1950-51 season. 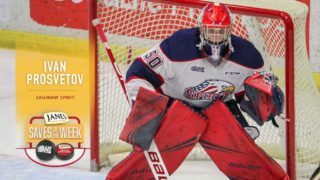 – DiPietro recorded a Spitfires record three straight shutouts on Dec. 8th in Barrie, Dec. 10th in Sudbury and Dec. 11th in North Bay, blanking the opposition on their respective Teddy Bear Toss games. Went a club record 209:23 without allowing a goal. – Alex DeBrincat joined Dale McCourt (1974-77) as the second player in OHL history to record three-straight 50-goal seasons on Feb. 20th in Oshawa. – DeBrincat became the eighth player in the OHL’s modern era to register three straight 100-point seasons on Feb. 15th vs. London. – DeBrincat became the leading goal-scorer in Otters franchise history on Feb. 2nd in Peterborough, scoring his 142nd career marker to pass Brad Boyes (1998-2002) for the club lead. – DeBrincat became the leading American goal-scorer in OHL history on Feb. 25th vs. Barrie, passing Rob Schremp’s career mark of 154. – DeBrincat recorded his 300th career point on Feb. 11th vs. Saginaw, following Dylan Strome and Brad Boyes as the third player in franchise history to reach 300. – Darren Raddysh became the Otters franchise leader in career points by a defenceman on Jan. 24th vs. Kitchener. Raddysh surpassed Chris Campoli’s (2000-04) 150 career points from the blue line. He finished his regular season career with 184 points (41-143–184) in an Otters uniform. – Darren Raddysh became the Otters franchise leader in career assists by a defenceman on Feb. 5th in Kingston, passing Campoli with the 120th over his career. – Dylan Strome became the Otters franchise scoring leader on Jan. 28th vs. Guelph, surpassing Brad Boyes (1998-2002) with his 310th career point. – Strome became the Otters franchise assists leader on Nov. 26th vs. North Bay, passing Connor McDavid with his 189th assist. – Strome recorded his 300th career OHL point on Jan. 13th vs. Ottawa. – Kyle Pettit played his 300th career OHL regular season game on Mar. 10th in London. He is the second player in Otters franchise history to play 300 games with the team. – Kyle Maksimovich had a run of 131 consecutive games (Mar. 14, 2015 in Kitchener to Feb. 25th, 2017 in Owen Sound) come to an end, marking the longest consecutive games played streak in Otters history. – Head coach Kris Knobauch became the second coach in franchise history to win 200 games on Feb. 17th in Mississauga. – Michael Cramarossa played his 300th career OHL regular season game on Mar. 10th at Niagara. – Darby Llewellyn became second player in Rangers history to play his 300th career OHL regular season game on March 14, 2017 vs. Guelph. Ended his OHL career second behind Andre Benoit for most career games played by a Ranger. – Head coach Dale Hunter became the sixth coach in OHL history to coach 1000 regular season games on Jan. 14th in Saginaw. – Michael McLeod set new Steelheads career marks for goals (60), assists (103) and points (163). – Spencer Watson recorded his 300th career OHL point on Mar. 19th vs. Niagara. – Jeremy Brodeur set a new Generals franchise record with his 10th career regular season shutout on Nov. 6th vs. Ottawa. This surpasses the prior mark of nine set by Ken Appleby in 2014-15. Brodeur finished his regular season career with 11 shutouts and the second most wins (70) in Generals history. – Head coach Bob Jones earned his 100th career OHL win on Feb. 18th in Owen Sound. – Head coach Jeff Brown claimed his 100th career OHL win on Mar. 18th vs. Oshawa. – Santino Centorame became the new franchise leader in points by a defenceman with 157 in an Attack uniform, surpassing prior mark held by Chris Bigras (155). – Michael McNiven became new franchise leader in career shutouts with 11 in the regular season, surpassing prior benchmark of nine held by Jordan Binnington. 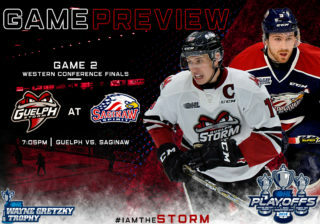 – Matt Schmalz played his 300th career OHL regular season game on Mar. 2nd in Peterborough. – Head coach Stan Butler earned his 700th career CHL coaching win on Mar. 16th vs. Sudbury. – Brandon Prophet played his 300th career OHL regular season game on Feb. 23rd vs. Kingston. – Bobby MacIntyre played his 300th career OHL regular season game on Mar. 5 in Kitchener. – Michael DiPietro set a new franchise record with his eighth career shutout on Feb. 2nd vs. Saginaw. – Jeremiah Addison played his 300th career OHL regular season game on Feb. 26th vs. Sarnia.